If there’s one era of fashion It girls can’t seem to get enough of, it’s the ’70s. Can we blame them? The decade is responsible for pioneering major (and we’re talking major) trends that still stand up today. Combine that with the warm earth tones of the time, and it’s no wonder we’re seeing bits and pieces of the decade in ’70s-inspired outfits for the fall. Whether you realize it or not, the ’70s have practically been woven into the DNA of today’s trends. Just take a look at the Western trend that’s been taking over our Instagram feeds or the return of flowing boho dresses and corduroy. Sure, these styles have evolved over the years, but there’s a reason they keep coming back into the cycle. While you might not want to dive head-first into the throwback styles of this period, there’s always a way to incorporate a retro-inspired piece or two into your everyday ensembles. Take a cue from some of our favorite fashion girls and give a nod to the iconic era this fall. 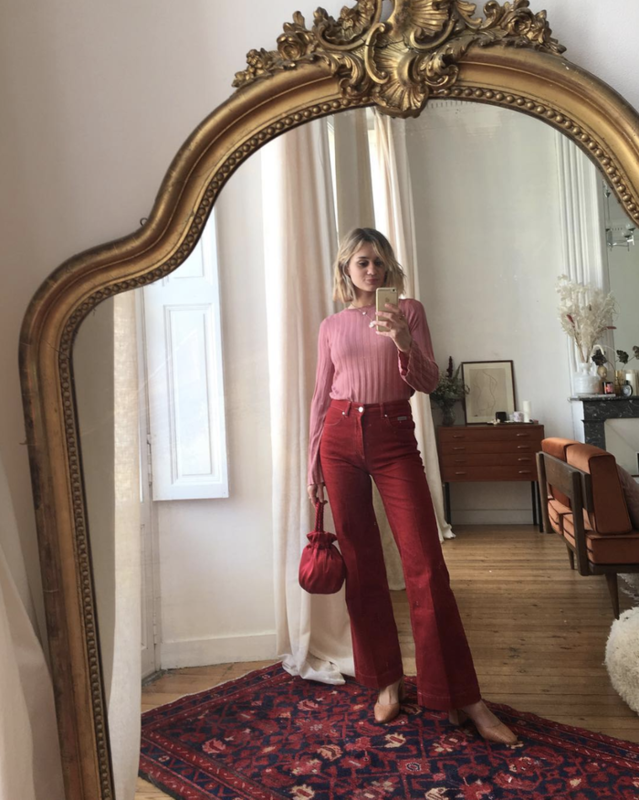 A pair of red flare pants will give you major '70s vibes. Play up the color and style it with a pink sweater. You'll love this for fall. Does it get more '70s than a denim jumpsuit? Let that be the hero of your outfit and style it with classic tennis shoes. Who doesn't love a one-and-done piece like a jumpsuit? Patchwork denim was a major staple during the '70s. For 2018, we love these contrast-paneled jeans with a white jacket. These pants will turn heads. For such a psychedelic decade, we can't get over printed blouses. Pair yours with flared pants for an ultimate '70s outfit. Wear a sleek bralette underneath. Available in sizes 36 to 46. Let's not forget the major boho movement that was occurring during the decade. Layer a lace maxi dress over a lace shirt to channel this outfit. We can't take our eyes off of this. Layer this under all your dresses this fall. Yes, corduroy is back and better than ever. Wear yours in the form of a suit. We can't get enough of corduroy pants. A pair of high-waisted wide-leg jeans is so reliable. Pair yours with a ruffle blouse to give it a flirty twist. How cute is this top? Available in sizes AU 4 to AU 12. The '70s were known for major trends like the rise of velvet pants. Sport a pair with a simple turtleneck sweater on top. This will become a classic. How cool are these corduroy pants? High-waisted pants will always be a '70s trend that stands up as a classic trend. Wear yours in a neutral-hued outfit for classic vibes. This tee looks so comfortable. See? Khakis can be chic. So, how will you be wearing the 1970s in 2018?